NV Logistics has been awarded the Neutral Administration label for 2017, based on an in-depth evaluation of our internal administrative resources and processes. We earned this label thanks to the close collaboration with ecoLive, a local Geneva-based environmental agency who guided us through the certification process. 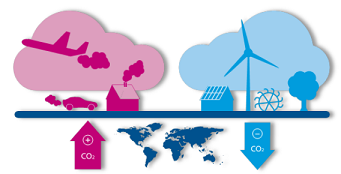 The myclimate method calculates a monetary value based on NV Logistics’ unavoidable greenhouse gas emissions. NV Logistics subsequently decided (there is no obligation) to walk the talk on climate change and donate this monetary value to projects which are committed to reducing greenhouse gas emissions. The Neutral Administration label signifies that we compensate for our unavoidable carbon footprint by helping those who can to reduce theirs. It is important to understand that the described compensation approach functions because the carbon footprint is not tied to a location. The climate is indifferent as to where on the surface of the earth the unwanted gases escape into the atmosphere, and where they are reduced. If you wish to learn more about the myclimate label or are tempted to obtain the label for your own organisation, please check out our blog post entitled Hello Footprint – What’s yours? If you are already our customer or plan to work with us in the future, have a look at the two projects we support… because these projects are also yours! NV Logistics is proud to support two projects. Besides contribuating to the climate-neutral objective described earlier, our donation induces other positive outcomes. 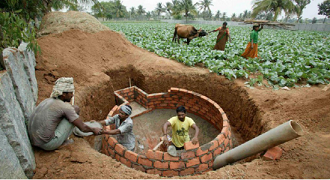 The Indian project gives low income families access to highly performant clean technology. By doing so, we propel disadvantaged communties into a virtual circle of sustainable development. The biogas solution eases – amongst others – health problems due to indoor pollution caused by traditional, inefficient firewood or kerosene based cooking stoves. 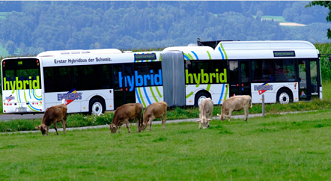 We support the Swiss project because we appreciate public transport organisations who play a pioneering role in using electric and hybrid buses on Swiss roads. Today, the presence of such buses remains insignificant, estimated at less than 1%. Conventional diesel buses are still the first choice for new acquisitions! 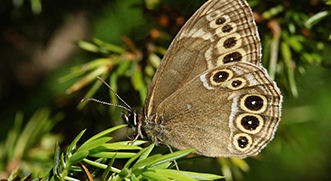 A third project which is close to our hearts as it helps promote and protect biodiversity. We help eliminate the use of wood from this Jurassic Forrest Reserve, as the Forrest biomass absorbs CO2 from the atmosphere reducing its concentration in our atmosphere. Another positive benefit in stopping (or reduction) in the wood logging allows the establishment of natural habitats for endangered species including the “Bacchantes”, the “Rosalie des Alpes” and wild cats.